Believers Church of Suffolk, Virginia is changing that perception. Their story is unique. They’ve faced the obstacles of growth, including outgrowing their space multiple times, an overtaxed ministry team supporting multiple weekly services, and turning families away from children’s ministry due to overreaching ratios. To meet these challenges, they sought a new design model to increase space and serve their growing community for years to come, implemented a secure children’s check-in solution, and kept family needs as their priority. Doing things differently has it benefits. Space was at a premium and the biggest hurdle for this growing church. Believers Church had added as much room as possible to the current facility. 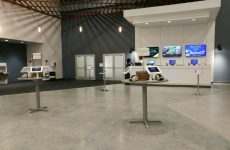 “We began outgrowing our facility and added on and reconfigured as much space as we possibly could. Then we went from one service, to two services, to three services and finally four. It was like turning tables in a restaurant,” described Lara Cash, Administrative Assistant to the Children’s Ministry Director for Believers Church and the staff report for their Children’s Ministry Guest Services (Check-In Team). Their options were to go the multi-site route or move to a bigger facility. They chose to pursue a bigger and better space. To generate ideas, the senior leadership team attended a seminar hosted by Building God’s Way (BGW), an award-winning, leader in faith-based design and architecture. The result is Hub 757, a premier event center, owned by and home to Believers Church. It’s a brand new, 60,000 square foot facility that has a mix of industrial and rustic design elements which is representative of the community’s military, shipyard, and farming history. During the week, Hub 757 is a place for the community to do life together, with several distinct event spaces, a large auditorium, and both indoor and outdoor sensory-friendly spaces. The building rarely sits empty with a majority of the space being used each week for community meetings, events, and education (The Oak and Lily Academy for infant to 1st grade). On Sunday’s, Hub 757, is the home of Believers Church, a thriving, diverse community, which values connection, worship, and relationships for both children and adults. The continual use of space was a core concept of the new design and provides Believers Church with an additional stream of income to assist in supporting their growth and outreach. It’s a unique juxtaposition of community, meeting space, and ministry. Church buildings sit empty the majority of the week. Along with the new facility and the continued growth of children’s ministry came the need to implement technology that increased efficiency, improved data management, and empowered volunteers and staff to assist families. That’s why they chose KidCheck’s electronic children’s check-in system. It’s innovative technology and multiple security features benefit staff and volunteers while offering families the consistent, high level of service they expect from Believers Church. Further enhancing the facility is a well-designed children’s check-in area. 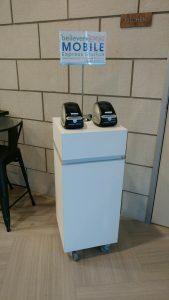 It’s a mix of computer based check-in and KidCheck Express Check-In, where parents use their own smartphone to check their children in. 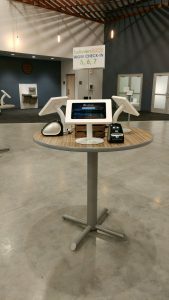 For families who use Express, satellite tables are available, equipped with tablets, a printer, and the PrintHub Express for lightning fast printing. For returning guests, those with questions, or in need of setting up their KidCheck account there is a main desk. Families simply walk up and check-in their kids quickly and easily, in the way that works best for them. “Convenience, accessibility and modern children’s check-in options are what KidCheck has provided. Plus, having the Support team available on Sunday is a huge help, especially when you’re just starting out,” adds Cash. Another key technology element used is the KidCheck Admin Console App which increases classroom efficiency, builds stronger child security, and allows for quicker communication with parents. It’s used by staff, leadership, classroom leads, guest services and the church security team. In the classroom, the Admin Console provides quick access to important information such as a live roster, child pick-up alerts, allergy information, and child check-out. For the security team, it provides faster response to incidents and at-a-glance information on who is authorized and unauthorized to pick up a child. Should evacuation ever be needed, the team has direct access to the location of each child. The innovative use-of-space and technology aren’t the only aspects fueling the growth of Believers Church. Another is their laser focus on meeting the needs of children, their parents, and families of kids with special needs. Within the children’s ministry is a program called Champions Club which directly meets the requirements of families with special needs. It enables the church to come alongside children and families within this special community. For Believers Church, Champions Club began with a single caddy in a room that contained items to help children with sensory needs. Next, it evolved into a mentoring program between a children’s ministry leader and each child. Today, there are four different classrooms designed for worship, sensory, motor skill development, and tactile learning, with the goal to integrate the children as much as possible. Champions Club even has their own entrance with a separate children’s check-in station for speed and efficiency. This helps children who are sensitive to stimulation and are uncomfortable entering a loud, crowded and echoing facility. For Believers Church, technology is the key to doing more with less. It connects each team with information they need to do their jobs, and provides efficiency and data for faster follow up and better decision making. Believers Church prioritized innovation and technology. They embraced change, created a unique model, and prioritized the needs of families. The rewards have been explosive growth, support for families with needs and children are never turned away.